Optimization of the special plant production site filling process at Echirolles. Caterpillar France called upon the services of Filling | Sealing teams to rethink the filling process on one of the two assembly lines at its Echirolles site. The aim was to increase productivity and improve quality, plus provide improved ergonomics and safety for operators. The project was undertaken hand-in-hand with the client, and the results exceeded their expectations. Caterpillar is a global leader in the manufacture earth-moving plant and construction equipment, their site at Echirolles, East of France, covers more than 75,000sqm and is comprised of two assembly lines. The first, is a continuous flow process whose filling equipment was supplied by Fives Filling & Sealing in 2011. This line is dedicated to the production of tracked equipment, tracked loaders and earth moving and levelling equipment. 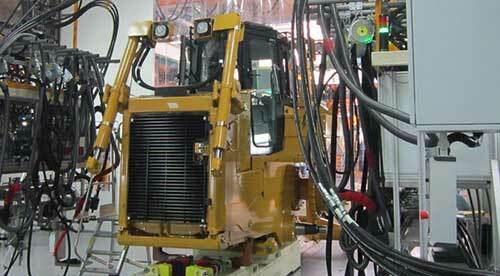 The second, non-continuous line assembles caterpillar excavators. On this second line, the filling of fluids into various types of excavators is carried out at several stations spread throughout the entire site, with non-repeatable cycle times of more than three hours at the time. In addition, topping up of oil was carried out manually when the vehicles were started up and at the various stages of manufacture. Finally, the slippery floor and the odor emanating from the oils meant that working conditions were far from optimum. In 2012, Caterpillar France initiated a project to increase productivity by improving the filling process and filling quality on this line, while ensuring the best ergonomic design for work stations and maximizing operator safety. Fives was able to provide a bespoke solution which went beyond simply the supply of equipment and started wth feasibility studies carried out during the preliminary phase. Designed around a standard RapidCharge® machine, the continuous-flow system combines all the filling operations in just one station. This station can detect the engine model and automatically adapts the type and the volume of the fluids delivered. In addition to the purge liquid recycling units, the station includes a tooling drip-prevention device and a vapor extraction system which meets site Health/Safety and Environmental constraints. It also incorporates motor-driven mobile stations on each side of the vehicle which ensure that the tools are correctly positioned as the vehicle moves forwards and which ensures that they are returned to the start zone. The manual top-up operations were eliminated by incorporating systems for detecting the liquid levels in the reservoirs. Other advances were also made. These included filling under vacuum, depending on the circuits involved, authorization of vehicle start-up linked to the quantity of fluids added, the location of the tooling in position without line constraints and reduction in the oil viscosity. These changes reduced the cycle time by a factor of ten, while improving the line productivity by 37% and improving the quality of the filling operations. This project illustrates Fives' capacity to listen to customer’s needs as well as demonstrating their level of engineering skill.